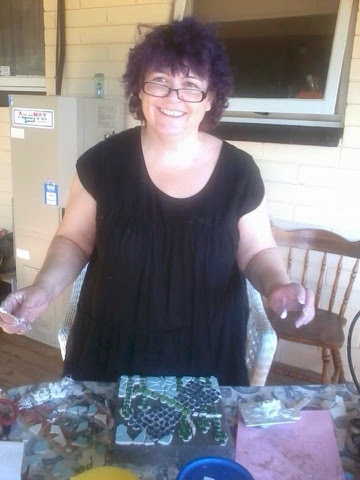 Yesterday's "Something on Saturday" was not on because I spent the afternoon being introduced to creating mosaics, using tiles with proper tiling glue and grout. I've only ever done tiling with paper or fabric but have always wondered what it was like to use tiles, but not enough to go out and do either a class and/or buy the tools required as it can be a bit pricey. My bestie has been doing mosaic lessons with her local school's art teacher, creating tiled marvels for the school garden, so while visiting me for the weekend she brought all her supplies plus some tiles for me too!! Isn't she wonderful? Knowing me as she does, she came with gorgeous glass tiles for wings, green tiles for reeds and blue for water! I have these round flat glass (tiles?) things that I use in vases which were perfect for the long body. 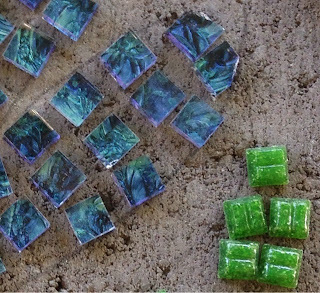 So by now you'll have guessed that I made a mosaic dragonfly! Tomorrow we will add the grout and I'll add a new pic. So far its looking pretty good! 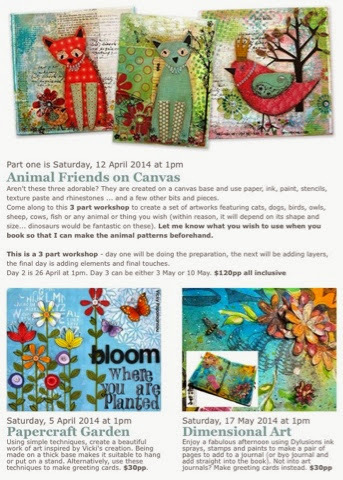 Next Saturday afternoon during the "Something on Saturday" class, the plan is to make a papercraft off the page project with paper flowers and stencils. 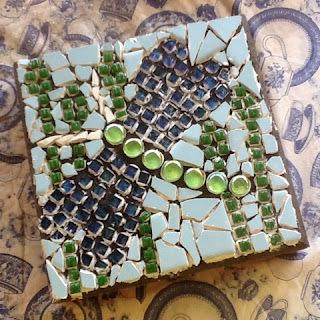 Check out the beautiful pic below for the inspiration of what we're making (its by Vicky Papaioannou) or read my latest newsletter with the details. The pic below is what we made last class... I think its turned out really well. 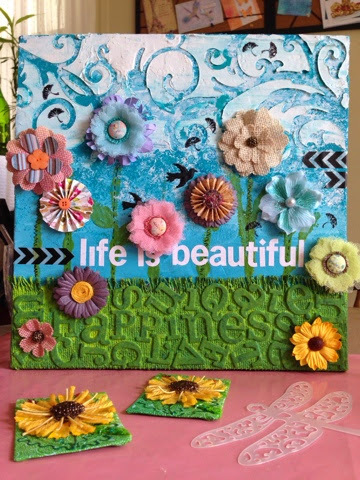 A bit of acrylic paint and texture paste with scraps of paper and some flowers (premade and handmade) can create a great piece of art!